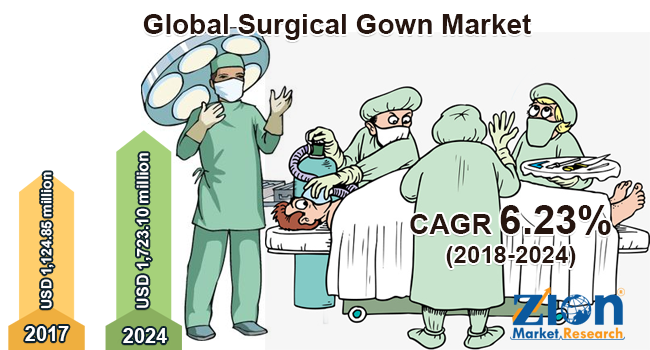 Global surgical gown market expected to reach approximately USD 1,723.10 million by 2024, growing at a CAGR of around 6.23% between 2018 and 2024. Surgical gowns offer protection and help to reduce the spread of infection. Gowns are the most important surgical apparel for an infection control strategy. The report covers forecast and analysis for the surgical gown market on a global and regional level. The study provides historical data along with a forecast from 2018 to 2024 based on revenue (USD Million) and volume (Million Units). The study includes drivers and restraints for the surgical gown market along with the impact they have on the demand over the forecast period. Additionally, the report includes the study of opportunities and threats to surgical gown market on a global level. To understand the competitive landscape in the market, an analysis of Porter’s Five Forces model for the surgical gown market has also been included. The study encompasses a market attractiveness analysis, wherein type segments and end-user segments are benchmarked based on their market size, growth rate, and general attractiveness. The study provides a decisive view of the surgical gown market by segmenting the market based on product category, distribution channel, end-users, and regions. All the segments have been analyzed based on present and future trends and the market is estimated from 2018 to 2024. Based on the product category, the global surgical gown market is segmented into disposable and reusable. Based on the distribution channel, the surgical gown market is segmented into online sales, retail pharmacies, and direct sales. Based on end-user, the surgical gown market is further segmented into clinics, diagnostic centers, ambulatory surgical centers, and hospitals. The regional segmentation includes the current and forecast demand for North America, Europe, Asia Pacific, Latin America, and the Middle East and Africa with its further bifurcation into major countries including the U.S., Germany, France, the UK, China, Japan, India, and Brazil. The report includes detailed profiles of key players in the surgical gown market across the globe such as Paul Hartmann, Molnlycke Health Care, Steris Plc, Thermo Fisher Scientific Inc., Cardinal Health, Inc., and 3M. Increasing the level of safety has become the main concern for the surgical gowns manufacturers. Moreover, Ahlstrom, and ATS Surgical, BATIST Medical, Bellcross Industries, Exact Medical, Foothills Industries, Cardiva Integral Solutions, Halyard Health, Guardian Surgical, Haywood Vocational Opportunities, Medline, Lac-Mac, Pal Surgical Works, Priontex, Synergy Health, Safetec Healthcare and Hygiene, Surya Textech, DuPont Medical Fabrics, Kimberly-Clark Health Care, and Medline Industries are some of other manufacturers of the global surgical gown market. The detailed description of players includes parameters such as financial overview, business strategy, key developments, and company overview of the company.